Try Scuba Diving In Thailand - Take Your First Breaths Underwater! When you meet people while backpacking through South-East Asia, they often recommend diving. It is on many bucket lists and gap year must do’s. Maybe you are still wondering if you should try scuba diving in Thailand? This article will debunk some of the mysteries and concerns people have when considering a try dive. Where exactly in Thailand should you go scuba diving? Koh Tao is widely agreed to be one of the best islands and destinations for new divers. Here are five reasons why. Scuba diving is classified as an extreme sport. Most people have a primal fear of deep ocean water. What about the pressure? In fact thousands of people learn how to scuba dive all year round. It can be learned and the theory session during the one day scuba diving Koh Tao program takes about 30 minutes. Children from the age of 10 years old can complete the diving license! 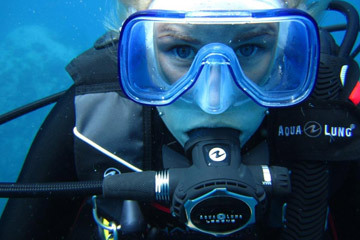 Diving is often thought to be expensive. The truth is it doesn’t have to be. It depends where you try diving. Cheaper diving does not mean less safe. It is simply cheaper for a scuba diving school in Thailand to run an operation than in other parts of the world. So, how much does it cost to scuba dive in Thailand? At Sairee Cottage Diving our Discover Scuba Diving program is 2000 THB! This includes the pool session in the morning and a dive in the ocean. If you loved it (be warned most people do) you can opt to do a second dive for an additional 1000 THB. Now that is value for money. Diving is cool. I have attempted to compare it to other sports and come up short every time. There is simply nothing like it. Strapping a compressed air tank on your back and signalling “Ok!” to your dive buddy and then descending underwater is an exhilarating experience that you should not go without. I travelled, discovered scuba diving and now I have been a dive professional for 5 years. Never intended to. All of our staff have a similar story. Our collective experience and passion for the sport is infectious! If you don’t try it, you will never know. Countless students of mine have made diving a career, some still message me years later that they have just been on an awesome diving holiday somewhere. It may seem that divers are lazy. This is somewhat true. We love to lead an easy and relaxed lifestyle. However being underwater actually burns between 400-600 calories on one dive! So if you pack in two dives in an afternoon, you definitely deserve that pizza and beer in the evening. This is how we and most scuba divers justify their decadent lifestyle. With all these reasons, it would be rude not to at least consider it 🙂 Come on over to Koh Tao and try scuba diving in Thailand on one of its most beautiful islands. One of us would love to show you the stunning underwater world that Koh Tao has to offer.